Eris was the Greek goddess of Strife, Discord and Rivalry, a goddess who caused the smallest argument to erupt into more serious events, including war. Eris was arguably the opposite of the Greek goddesses Harmonia and Dike. The goddess Eris was said by Hesiod to be the daughter of Nyx (Night), and therefore a dark goddess alongside siblings like Geras (Old Age), Moros (Doom) and Thanatos (Death). As with many children of Nyx, some writers in antiquity would name Erebus (Darkness) as the father of Eris, although more often no father was named. Eris is sometimes called the sister of Ares, which would make her parents Zeus and Hera, but this is probably because the names of Eris and Enyo, a Greek war goddess, were used interchangeably by some writers in antiquity. Eris was often said to be found on the battlefield alongside Ares, delighting in the pain and suffering of soldiers, and cajoling fighting sides to fight on until the decisive win is achieved. Though the slaughter associated with Eris might be disagreeable, she was also used by the gods during the Trojan War to keep the Achaean force fighting. Away from the battlefield it was also Eris who was said to cause men to deadly retribution taking a life where a life had previously been taken. Eris though, could also ensure that the smallest disagreement between parties could erupt into bloodshed. The goddess Eris is mentioned in one of Aesop’s fables, for Heracles was making his way through a narrow pass when he observed an apple on the floor. Heracles hit it with his club, but rather than it being smashed, the apple expanded to twice its size, and it expanded once again when he it again. Athena would have to explain to the Greek hero that it was an apple of Eris that would stay small if left alone, but if it was fought then it would keep expanding, just as strife does. The most famous tale of Eris revolves around the wedding of the Greek hero Peleus and Thetis. ​The wedding was a joyous affair, to which all the gods and goddesses were invited, but not wanting strife at the wedding, Eris was not invited. 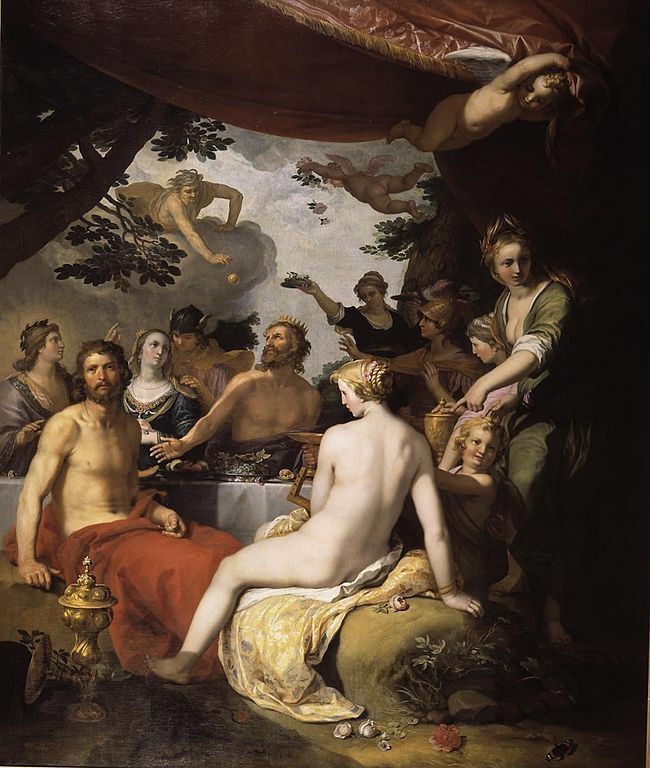 When Eris found out about her omission from the wedding quests, she took one of the Golden Apples of Hera and inscribed upon it “For the Fairest”; then despite not being invited, Eris turned up at the wedding feast, and threw the apple amongst the assembled guests. The throwing of the apple caused Discord amongst the assembled guests, for three goddesses claimed the apple for their own, each believing that they were the fairest; these three goddesses were Hera, Athena and Aphrodite. 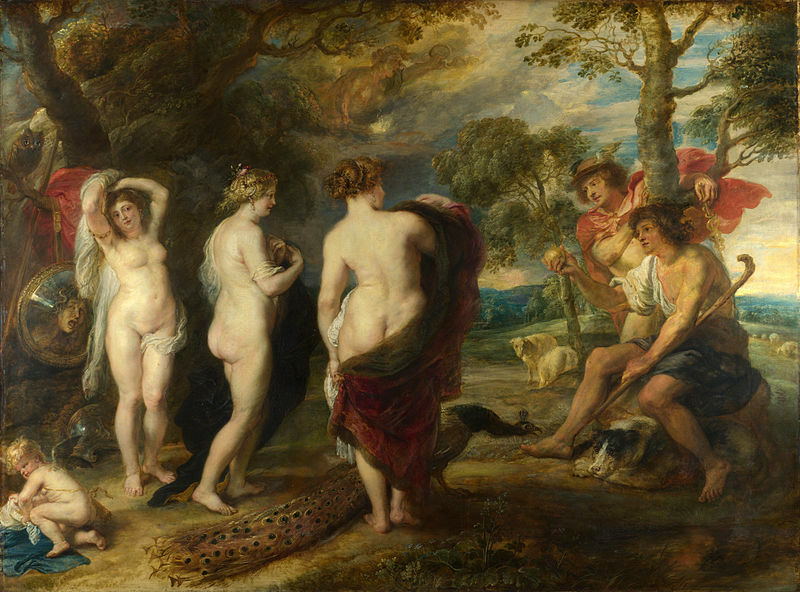 These conflicting claims would lead to the Judgement of Paris, and thereafter the Trojan War. Thus Eris had lived up to her reputation as from one small thing, the throwing of an apple, a war erupted.